Writer. Also, trivia champion. Also, bowling champion. Here’s an interesting bit of trivia. The only really successful slave rebellion in history was the Haitian Revolution. Other slave rebellions certainly had an impact. The War of Spartacus, obviously. The 1811 German Coast Uprising in the American South. The Zanj Rebellion in Persia. There’s a long list. But those rebellions were all eventually crushed. The rebellion in Saint Domingue (as Haiti was then known) instead led to the establishment of a free republic. Here’s the guy who led most of it, Toussaint L’Ouverture. The social and political factors that contributed to the 1791-1804 revolution are many and complicated, and I won’t pretend to have a proper grasp of them all. Here and here are some more detailed articles on the matter. But the French Revolution certainly had a lot to do with it. In 1789, ideas about equality among men were brewing in France. That year, Revolutionary France published The Declaration of the Rights of Man, in which all men were declared free and equal. It wasn’t an abolition of slavery, but it was something. Down in the colonies, plantation owners weren’t all keen to acknowledge this declaration. But slaves in Saint Domingue weren’t keen to ignore it. The slaves revolted and a civil war broke out in 1791. By the following year, the former slaves controlled about a third of the island. Then on February 4, 1794, France officially abolished slavery in its colonies. Hooray! But hang on now, not so fast. When Napoleon came to power in 1799, he announced a plan to draw up a new constitution for the colonies. It was generally suspected that this meant he was getting ready to reinstitute slavery. And so Toussaint drafted his own constitution for Saint Domingue, in which he emphasized the liberty of all men and declared himself governor-general for life. Napoleon then sent thousands of troops, led by General Charles Leclerc, to Saint Domingue to reestablish French authority. But he was sneaky about it. He instructed Leclerc to pretend to go about this business by relatively peaceful, diplomatic means, but then bring down the hammer — disarm all black rebels, reinstitute slavery, and deport the rebel leaders. The plan didn’t go off smoothly. Fighting broke out between the French and the rebels, and lasted for months. But eventually Toussaint was arrested and stuck aboard a ship bound for Europe. That was in 1802. The next year, Toussaint died in a French prison. And indeed, the rebellion carried on after Toussaint was imprisoned. 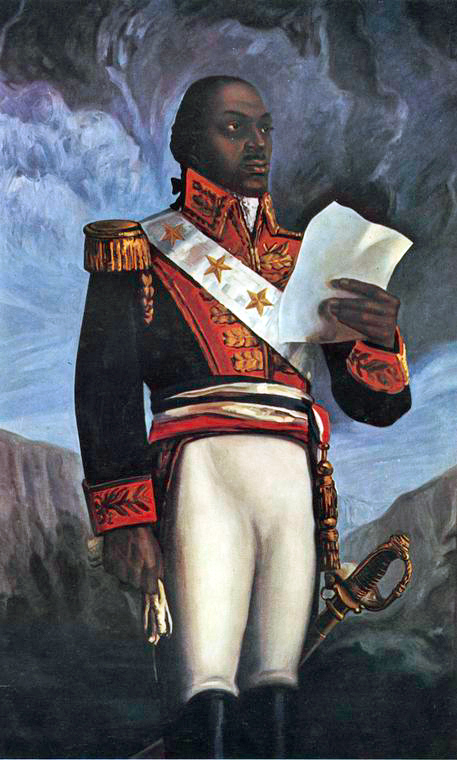 In 1804, the rebels gained independence and established the Republic of Haiti. It was only the second nation in the New World to win its independence. The first was America. Wikipedia estimates that 350,000 Haitians and 50,000 European soldiers died during the rebellion.